Compact with well defined edges. Very bright. 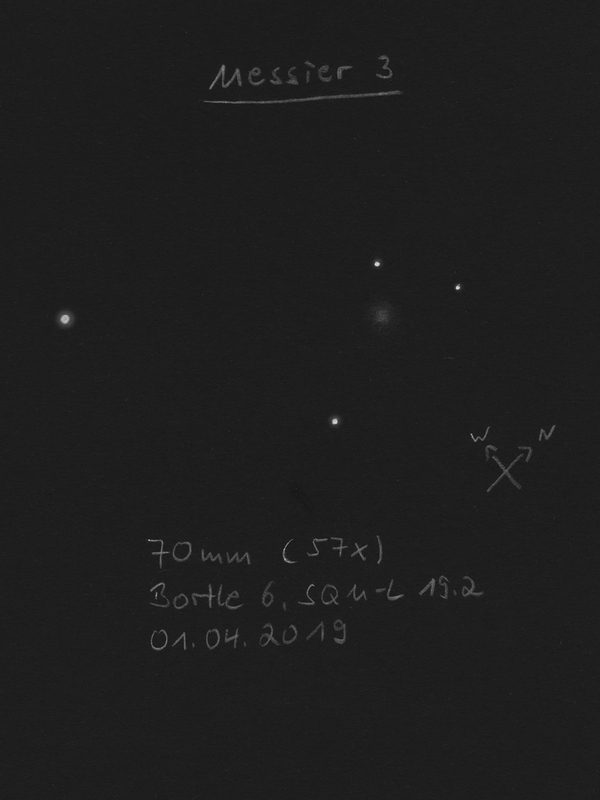 Despite of massive light pollution (city & half moon) and large exit pupil of 7mm I could easily see M3 with direct vision as a quite small, but bright nebula. At 22x quite conspicuous with very bright, well defined center, getting much fainter towards the edges. At 57x the outer parts appeared slightly granulous with averted vision. Apparent with direct vision due to the bright, well defined center. Outer regions much fainter. At 62x the outer regions seemed slightly granulous. Very nice view. At 125x the outer parts were quite well resolved and the cluster appeared granulous close to the center. With averted vision I could also glimpse some individual stars. At 50x the outer regions appeared granulous, at 100x quite well resolvable. Hazy sky, 1/3 moon: At 18x well defined, very bright center. The edge regions appear granular with averted vision. At 75x the edge regions are partly resolved, the cluster itself appears granular. The center is very compact.